Next review Omega Xl - What a joke. Apr 08, 2016 We are not “Life’s Abundance” and the product you are referring to is not ours. 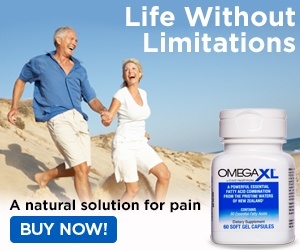 Omega XL has hundreds of thousands of satisfied customers who continue purchasing it on a monthly basis. They have sent thousands of testimonials to both the quality of our product and our customer service. I purchased a bottle of omega 3's by Life's Abundance..it is suppose to be of the highest quality...I use plastic cups.... and rinse them out and reuse them...I poured water into the cup after I had used it for these omega 3'a and to my big surprise...water went every where. I looked in the bottom of the cup and there was a big hole where these omega 3 had eaten away the cup!!! I tried it 2 more times...with new cups just to be sure...I was so surprised! Can you believe it? This is what I put in my body???? What type of chemical is this...the only other chemical was a "tangerine flavor" and did not elaborate.....Buyer beware!!! Review #230231 is a subjective opinion of highfashion. think about it...that's fast absorbing...so if i eat fish i'll be like that cup...lol think about it. our stomachs are so strong we can withhold many acid based products. lining after lining. so a little fish pill isn't anything!!!!!!!!!!!!!!! I am a disabled war veteran. My service of 25 years started in Lybia and ended in Afganistan. My war scars are many. I have tried everything and the only thing, The ONLY THING that works because its 10 times more absorbable than anything on the market is Melaleuca products. Actually if ur foam cup disintegrated than thats a good thing because in your body thats how quickly igs working. Its burning the fat in your arteries fast. So if it didnt burn through the cup than it would mean that it is very slow for it to work in ur body. Foam cups have petroleum jelly so the omega is burning that petoleum from the cup. I use and sell herbalife and our omega is jist as strong. I have my testimony. This must be good too. I have later found the answer...do not know if it is correct....what do you think? here is their answer:Does Your Fish Oil Eat Through Plastic? Get a styrofoam egg carton. Cut out one of the styrofoam egg cups. Set it open side up (like a little bowl) inside a clear glass. The glass must be made of glass, not plastic, for this to work. Put a small amount of fish oil in the egg cup. You can either pour in a small amount of liquid or break open a capsule and pour the fish oil into the egg cup. 1. Nothing will happen. The oil will just sit there in the egg cup. 2. A little bit of bubbling and oozing will happen. A small amount of the oil will ooze through the styrofoam, and youâ€™ll see it in a little pool or smudge on the bottom of the glass. 3. All or most of the fish oil will permeate through the styrofoam and collect in the bottom of the glass. A small amount of residue may be left in the egg cup. 1. If nothing happens, then the fish oil is not ultra-refined. In other words, the molecules in the fish oil are larger than they are in ultra-refined oils. The larger molecules mean that your body will do less well at absorbing and getting benefits from this fish oil. Less refined oils may also look cloudy, because they contain other fatty acids that are basically useless. This is an inferior grade of fish oil. 2. If a little bit happens, then the oil is moderately refined. Again, it contains many molecules that are fairly large, so it wonâ€™t be absorbed by the body as well as it could be. 3. If all or most of the oil permeates the styrofoam, it is ultra-refined fish oil. A small amount of residue left in the egg cup is probably an antioxidant added to the oil, such as sesamin. Sesamin, which is derived from sesame seeds, is an excellent addition to fish oil. Ultra-refined fish oil is very different from typical fish oils. Technically speaking, ultra-refined fish oil is a concentrate of fatty acid ethyl esters. By comparison, typical fish oils are fatty acids assembled on a triglyceride backbone. The fish oil molecules change from the triglyceride compound to the ethyl esters because toxic contaminants that are found in all fish oils are removed during the ultra-refining process. The complex refining process also significantly increases the concentration of the long-chain omega-3 fatty acids, and thatâ€™s a good thing. There are other noticeable differences between ultra-refined fish oil and typical fish oil. First, ultra-refined fish oil flows like water; typical oil doesnâ€™t. The increased flow of the ultra-refined fish oil improves the incorporation of the oil into the cell membranes that line the intestines. Typical fish oils must be broken down by various enzymes before the fatty acids can be absorbed, and this can be an inefficient metabolic process in many people. On the other hand, ultra-refined fish oil can penetrate porous surfaces such as plastic, just like it enters into cell membranes. Thatâ€™s why the ultra-refined oil will permeate the egg carton material. This means you must be careful when ultra-refined fish oil comes into contact with any porous surface such as plastic or natural stone. Prolonged contact can actually penetrate the surface and cause staining. Some people mistakenly say that the fish oil is â€œeating throughâ€ the plastic. Thatâ€™s wrong. Itâ€™s that the ultra-refined molecules are tiny enough to pass through the relatively porous material. The Lifeâ€™s Abundance fish oil products that we represent, SeaLogix Pharmaceutical Grade Fish Oils, are ultra-refined oils. The gel capsules include sesamin, an important antioxidant. Also, the gel capsules are a good choice for anyone who wants an especially easy-to-swallow version of the oil. Because of the ultra-refinement, SeaLogix has no fish taste at all. For more information on these SeaLogix Pharmaceutical Grade Fish Oil products, click here. This is a great post and informative. If you read any of the books about the new generation of fish oils, you will understand why the contents of this post are true. Read some of the books written by Dr.
Barry Sears to learn more about the new generation of fish oils. I wouldn't go a day without taking a highly refined fish oil.